Hope Malone should be spending Christmas in Manhattan, sipping cocktails in a fancy bar. Instead she’s back in Holly Bay, the quaint little seaside town on the Cornish coast that was her childhood home. Keeping her beloved Grandpa company is no sacrifice for Hope, though, he means more to her than anyone else in the world. With a job as a freelance editor that’s no longer living up to expectations, and wannabe popstar parents, who’ll do anything for fame, Hope has more than one Christmas wish. When she meets her favourite author, Jude Thomas, and he turns out to be the rudest man she’s ever met, she hates him on sight. It’s only when she loses the precious pendant her Nana left her, and Jude is the only one able to help her find it, that she begins to see another side to him. Meeting Jude forces Hope to admit she wants to be a writer, too, despite what she’s told her friends at the Mad Hutters’ writing group she goes to every week. There are already too many dreamers in her family, though. And with her parents starting a rap channel on YouTube – which seems doomed to embarrassing failure – it’s down to Hope to be the sensible one. 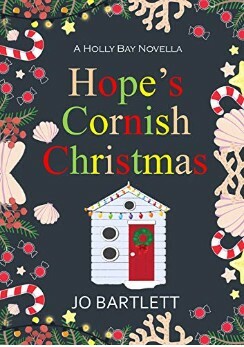 Desperately trying to hold onto Nadelik traditions and have a proper Cornish Christmas, Hope pushes her own dreams back down where they belong. But when she discovers that Jude is keeping a secret and he’ll soon be out of her life for good, having a happy Christmas seems like one more impossible dream. By Christmas Eve everything has changed and even Hope’s wildest dreams suddenly seem possible. The only things missing are Jude and her Nana’s pendant. Can Hope find the one thing that really matters in time to celebrate the perfect Christmas, or will some dreams always be just beyond her reach?